The Bowtie Parcel, or Bowtie Project, consists of 18 acres of post-industrial land owned by California State Parks. The site is found within an unassuming pocket of northeast Los Angeles known as Cypress Park, where gentrification is a growing concern given the fate of neighbors Silver Lake and Echo Park, LA River revitalization initiatives, and large-scale residential development. This riverside area, east of the intersection of the 5 and 2 freeways, is known as Elysian Valley, or Frogtown for the frogs that used to frequent the river. 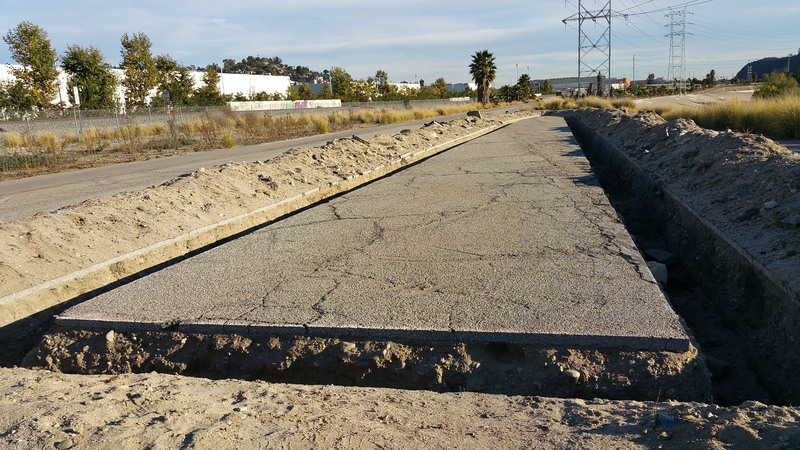 Shaped like a bowtie, hence the name, the site lies adjacent to Rio de Los Angeles State Park within the former Taylor Yard, a Southern Pacific Railroad service facility. The state purchased the Bowtie Parcel in 2003 intending for it to eventually become a full-fledged state park, but with no immediate plans for development. Setting foot into the Bowtie immediately evokes the immense variety and messy juxtaposition of nature and urbanity that represents Los Angeles as a whole, and the history of its river. White noise from not-too-distant freeways meets the rush of the river. Carefully-designed land art and interpretive signage meet furtively-scrawled graffiti. Bikers whiz by on land, while ducks cruise by on the water – each hardy creatures navigating challenging LA environs. Non-native fountain grass and Mexican fan palms meet and overtake decomposed asphalt, displaying nature’s uncanny ability to reclaim over time. Fragrant native plants white sage and yerba santa meet the vaguely chlorinated smell of the river. Concrete banks meet soft-bottom riverbed. 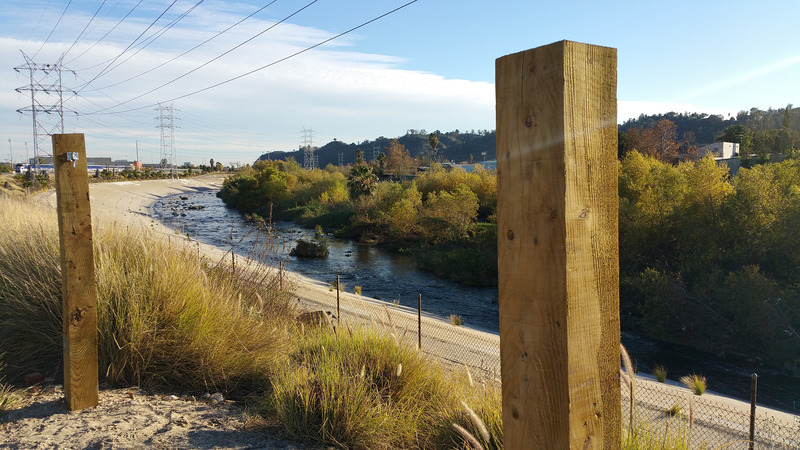 With the July 2015 passage of a $1.3-billion plan to revitalize the LA River, now pending approval from the Army Corps of Engineers and Congress, the Bowtie Parcel is already unique in its placement along the soft-bottom Glendale Narrows section of the river. In these 11 miles between the 134 and 110 freeways, or between the Verdugo Mountains and the Santa Monica Mountains, cement never set over the high water table when the river was channelized. Over time, wildlife returned. 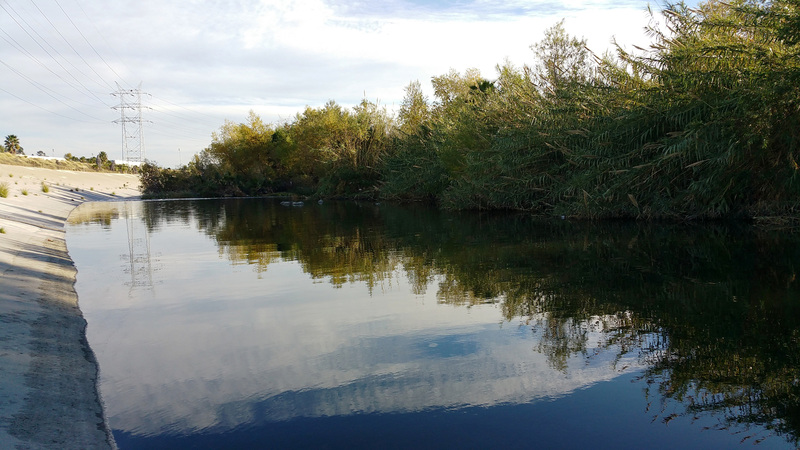 Concrete still slopes down to the water, but Arundo donax (giant cane), an invasive grass from Southeast Asia, grows along the water in lush abundance, softening the scene – and preventing erosion. Herons, cormorants, egrets, carp and green sunfish call the river home. It’s an unexpected oasis. Many Angelenos, unaccustomed to noticing the river, much less viewing it as an amenity, may not know its origins. It begins with the convergence of roughly a dozen creeks around Canoga Park in the western San Fernando Valley, flowing the length of 51 miles before emptying into the ocean in Long Beach. Unlike most other major cities, Los Angeles did not develop concentrically. The original pueblo developed between the hills to the west, and the river and surrounding fertile lands to the east. The river marked a convenient route to travel northeast out of the LA basin and south toward the port of San Pedro, and in the 1870s, the railroad was built adjacent to the river. This was the first step in disconnecting the city from the river as a recreational amenity. The second step was the channelization of the river in the 1930s and 1940s. LA’s population surged in the early 1900s due to cheap train fares west, and people settled along the river – a flood basin not suited for building homes. In southern California’s Mediterranean climate, with dry summers and rainy winters, flood control is only a seasonal consideration, but a serious one. During winter rains, the river swelled unpredictably. After extensive property damage and dozens of lives lost in multiple storms, the New Deal-era quick fix was to channelize the entire river, without evaluating the long-term impact on natural resources. Damming the river altered the fertile alluvial soil rich in nutrients, making the river inhospitable for the flora and fauna that once flourished there. Most major cities have a strong connection to a natural riverine setting. New York has the Hudson, London the Thames, Paris the Seine, and many central US cities such as Minneapolis, St. Louis, Memphis and New Orleans – the mighty Mississippi. With its numerous neighborhoods and no clear center – many areas competing with the only recently, increasingly renovated downtown – LA can seem disjointed and scattered, as does its river. 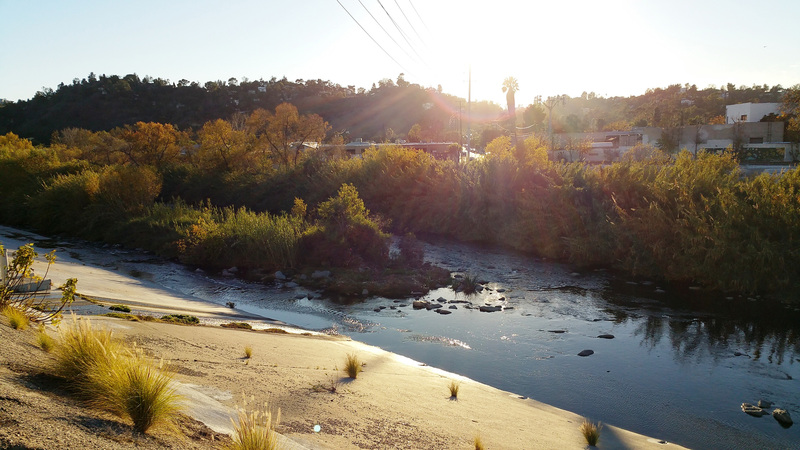 While LA has remained fundamentally disconnected from its river for more than a century, groups such as Friends of the LA River, Play LA River, the Army Corps of Engineers, and arts organization Clockshop have all worked to revitalize sections of the river. Following its purchase by California State Parks, the land sat unused for 10 years until Clockshop took interest from an arts perspective. They installed land art and interpretive signage, and facilitated events such as poetry readings, rain barrel workshops and urban campouts. 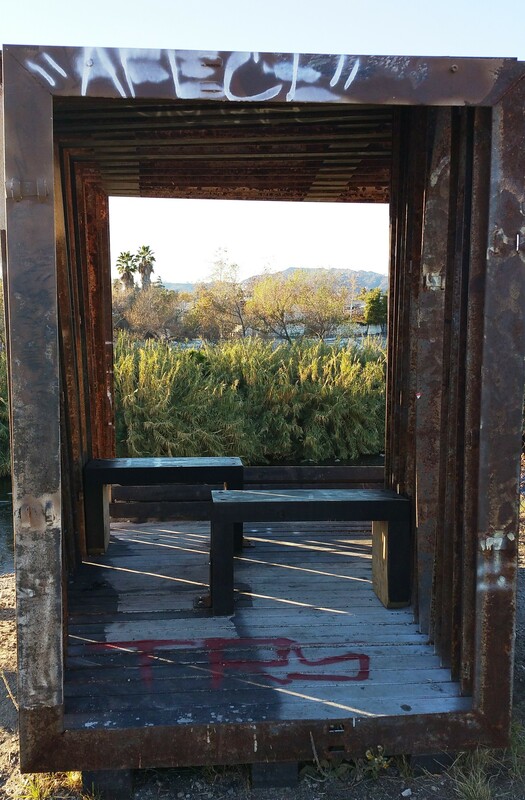 Moving through the Bowtie, you’ll first see interpretive signage in both English and Spanish by artist Rosten Woo. His statements subtly challenge social norms, such as comparing camping/sleeping outdoors with homelessness: “An urban campsite like this one highlights the contradictory attitudes we have towards sleeping outdoors.” Noting LA’s significant homeless population, the signs convey contradictory legislation from federal courts vs. local municipalities regarding the criminalization of vagrancy. The signage also links the increased desirability of riverfront land with the railroad’s legacy of Volatile Organic Compounds remaining in the ground. Following environmental remediation, developers would typically seek to build the largest possible structures so as to maximize profit. Public pressure can impact the regulations that developers must abide by, yet projects such as Futuro de Frogtown, which attempted to further engage the local community with government and developer stakeholders, met with limited participation and some resistance to any change. From the site entrance, visitors can walk adjacent to the river, toward a scrubby flatland with a roundhouse where trains were once serviced, now covered in colorful graffiti. A long view of the sky stretches overhead, with views of the Griffith Observatory. Posts rise at set intervals adjacent to the river, with hooks on which visitors can string up hammocks. Pieces of burlap appear in the ground, deliberately curved into berms, which help to prevent erosion. To create interactive spaces, Clockshop engaged Woodbury Architecture for Civic Engagement (ACE) students to design a firepit with removable seatbacks placed along concentric circles. They also created a viewing pod made from reclaimed steel, placed by a particularly peaceful view of the river. In addition, Clockshop worked with Chicano art collective the HOOD sisters (“Honoring our Origins, Ourselves and our Dreams”) to produce a mural on adobe bricks and a fresco (mural painting on plaster), meant to be ephemeral art. One of the most striking features at the Bowtie Parcel is “The Unfinished,” a to-scale replica of the largest known Egyptian obelisk from the reign of Pharaoh Hatshepsut (1479-1458 BCE). Clockshop engaged Los Angeles artist and sculpture professor Michael Parker to design the project. The original obelisk, reflecting power and fertility, was painstakingly carved by hand but never raised. Los Angeles’ version, likewise carved into the ground, appears rough as per its name. The project draws parallels between the two large civilizations of ancient Egypt and modern Los Angeles, and the rivers they dammed – Aswan’s High Dam and the LA River’s concrete lining, that achieved flood control but produced various unintended consequences. I came across Pharaoh Hatshepsut’s “Unfinished Obelisk” in Aswan, one of her many monumental commissions. Intended to stand at 137 feet tall and carved from a single piece of granite, the work cracked just before its release from the bedrock and was abandoned on site. I was attracted to the incredible collective energy that could build such an obelisk and the incredulous authority of one person to will such an undertaking. The ancient site is located in the same town as the Aswan Dam which in 1971 stopped the Nile’s annual flooding. This Nile dam, like our own California mega waterworks, is bitterly disputed. Non-native heavyweights at the Bowtie Parcel are prominently Arundo donax, Mexican fan palms, and fountain grass, which originates in Africa and thrives as it has no natural predators, and can grow in rocks. Several native plants also thrive however, such as California buckwheat, marked by clusters of small pink flowers that turn white and then brown. This plant is much-loved by birds who eat its seeds, and just as well, as marker #7 on the audio tour reveals, “More than half of the 500+ bird species in Los Angeles County can be found here.” Other native plants include fragrant white sage and yerba santa (described in tour marker #6), used by the Chumash as a decongestant and currently used in medicine to mask flavors, amplifying the cool of menthol/ peppermint while mitigating bitterness. LA’s architecture does not reveal its history as evidently as it does in other major US cities. However, gaining familiarity with native plants and indigenous uses helps to envision what the area was like before Europeans arrived to change the course of its history. There’s a lot to discover, as California is also a biodiversity hotspot, with 6,000 native plants, one-third of which are endemic – found only here. So it becomes a matter of focus. For now, it’s possible to immerse yourself in fishing, string a hammock, or sit and narrow your gaze under the glint of a setting sun onto a river that you have mostly or entirely to yourself. Diamonds dance on the water, and within a certain vantage point, this idyllic riverine view could be anywhere. The odd juxtaposition that it’s in the middle of the megalopolis of Los Angeles makes it all the more special. A wonderfully written and fascinating article! A unique perspective on what sounds to be a unique treasure. Now I wanna’ go see it!